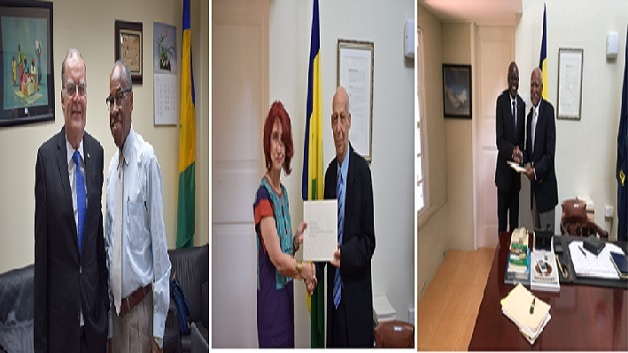 Three new envoys have been added to the list of accredited ambassadors to St. Vincent and the Grenadines as a means of strengthening diplomatic ties with those countries. The countries are the Republic of El Salvador, the Republic of Ghana, and the Republic of Ecuador. The Ambassadors were welcomed to this Island during the month of July, 2018 to present their letters of credence to Governor General, His Excellency Sir Frederick Ballantyne. On Tuesday July 17, 2018 at Government House, His Excellency Raymundo Ernesto Rodriguez-Diaz, Ambassador of the Republic of El Salvador presented his letters of credence to the Governor General. The Ambassador is accredited to St. Vincent and the Grenadines with residency in the Republic of Trinidad and Tobago. His Excellency Napoloen Abdulai, High Commissioner of the Republic of Ghana also presented his credentials to the Governor General on July 23, while on Monday July 30, 2018, Her Excellency Maria Augusta Calle Andrade, Ambassador of Ecuador presented her letters of credence to Acting Governor General, Mr. Noel Clarke. Both the Ghanaian and the Ecuadorian Ambassadors are resident in Cuba. A release from the Ministry of Foreign Affairs said that all these ambassadors have reaffirmed their countries commitment to enhancing and deepening their cooperation with St. Vincent and the Grenadines within the framework of south-to-south cooperation.